Every day here is different, but the first thing I do when I wake up in the morning is always the same—roll over to the right side of my small bunk and lift the metal cover on my porthole window. The frosty circle of glass showcases all kinds of remarkable sights. In the past four weeks, I’ve woken up to striking ice bergs, clumsy penguins, graceful humpback whales, thick fog, and miles and miles of ice. But this morning the porthole reveals something I have not yet seen in Antarctica—a white blanket of fresh snow covering the familiar landscape of Palmer Station. I laugh to myself, wondering which of these thoughts seems more ridiculous – that Palmer Station now feels like home away from home, or that I’m surprised to see fresh snow in Antarctica. After 25 days at sea, it feels amazing to step onto land (and into fresh snow!) at Palmer Station. It helps to think about how I got here. On the morning of February 13th, I flew out of RDU. Exactly 30 hours later, I arrived in Punta Arenas, Chile, and boarded a National Science Foundation research vessel with a team of marine biologists, and we set sail for the southernmost continent. That’s how I physically got here at least. But mentally, I’ve been in Antarctica for a long time. Three years ago, one of my favorite colleagues (a big deal in the marine science world) wrote me into a grant to document his research in Antarctica. Large science grants are complicated, and we didn’t know if or when it would get approved. Still, I was thrilled to know going to Antarctica was a possibility, even if it felt like a far-away dream. When the grant finally received official approval last spring, that dream suddenly became much more real. I’m going to Antarctica! I need to prepare myself! I spent months and months devouring books, blogs, podcasts, magazine articles, documentaries—anything I could get my hands on about the seventh continent. Yet as any seasoned adventurer knows, the guide books and internet searches (and even advice from people who have been) can only take you so far—you can’t really know a place until you get there. Ari Friedlander, the chief scientist on our team, prepares to tag a minke whale in Andvord Bay. Over the past few weeks, I’ve had the incredible opportunity to view the intersection of science and adventure against one of the most stunning backdrops in the world. Our team is using cutting-edge technology to gather data on humpback whales and minke whales, and my job is to document why and how they study these elusive animals. My understanding of baleen whales and the ecosystem of the Antarctic Peninsula has increased exponentially during this trip. I’ve taken thousands of photos and written two or three times as many words about our experiences thus far. Photographing a tagged humpback whale in Andvord Bay. But I’ve also been fascinated to learn about the culture and way of life at the bottom of the world. When the science team is done for the day, I often find myself immersed in conversations with the marine technicians and crew members on board. These folks have spent years working down here—not just on a ship, but at research stations across the continent. They patiently answer all my questions about what it’s like to split your life between this strange, special place, and wherever you call home. Julia Carleton assists with cargo operations aboard the Laurence M. Gould at Palmer Station. I’ve learned a lot from these conversations, but perhaps the loudest and clearest message has been this: the most far-flung continent is home to one of the most close-knit communities. Welcome to a place where the locals share a profound appreciation for the natural world, love a good adventure, and know how to take care of each other. During this expedition, we only spent three days at Palmer Station. But that was enough time to fall head over heels in love with the place. Just before our departure yesterday, I hugged five different people goodbye. I hope (and deep down in my gut, I know) they’re right. For the past few years, Antarctica has been a fixation in my mind. Perhaps, in the next few years, it can become a fixture in my life. Scientists and research support staff wave from the top of the glacier at Palmer Station. Want to see more photos from Marley’s adventures in Antarctica? Follow her on Instagram at @mlparkermedia and her research team at @insearchofminkes. Read more about the whale research at In Search of Minkes. 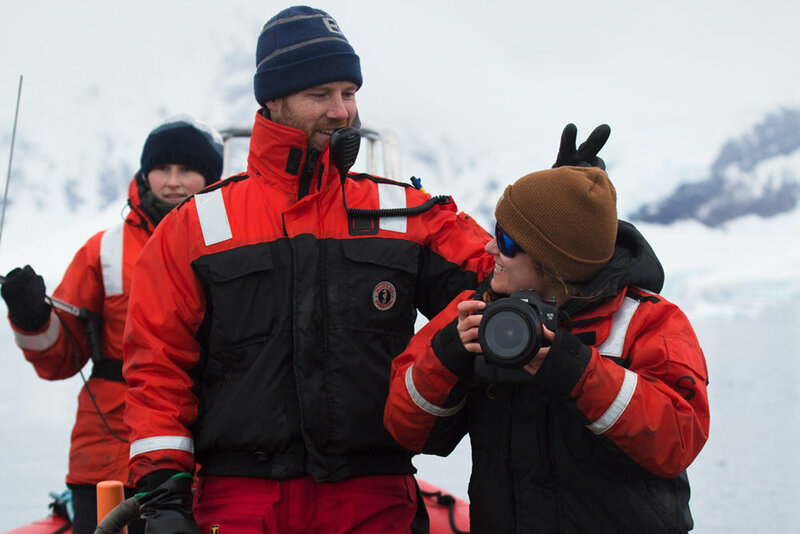 For more personal perspectives on life in Antarctica, check out Marley’s blog.